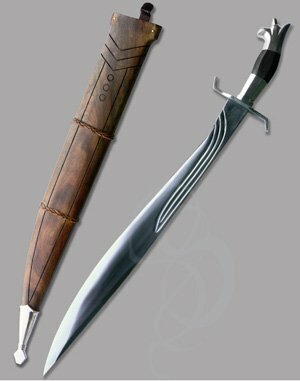 Question 1: What is the origin of this sword? A fantasy blade forged by gnomish smiths. 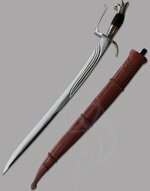 An Arabian short sword, made by master craftsmen in Damascus kiln. A reproduction of a Celtic weapon used to battle the Romans. The answer, of course, is all of these. The Laeonis can easily fit into any of these categories. 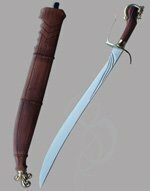 It has the shape and style of a fantasy blade, the feel of a Middle-Eastern scimitar, the shape of a Celtic sword, and the design of a pre-conquest-Phillipines martial-arts short sword. This is a fully tempered, battle-ready and sharpened short sword, and what a short sword it is! Master smiths have crafted this sword, by hand. And those same smiths created the uniquely carved, absolutely gorgeous wooden sheath that comes with it. And speaking of the sheath, this beautifully stained hardwood scabbard comes with a custom-designed metal clip that fits on just about any belt. How’s that for efficient? Both the blade and grip of the Laeonis have a forward tilt to them that gives maximum leverage when cutting. The blade itself is wide, but still light and comfortable to hold. The lighter weight is due, in part, to the stylish grooves carved into the metal, near the grip—grooves that have a decidedly fantasy or Celtic feel to them. The pommel is lobed, and this, too, can be seen in a number of ways. Viking swords had lobed pommels. But the fashion in which the lobe is split also calls to mind a European fleur-de-lis, or perhaps an Arabian palm? Okay, time for the reveal. 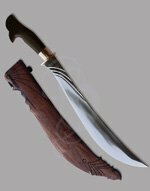 This weapon is, in fact, a Filipino cutting blade, used by master martial artists around the world in competitions and for cutting practice. 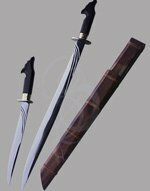 The blade is an incredibly good for cutting, and the weapon itself has a wonderful forward balance that has endeared this weapon to swordsmen the world over. And to collectors of fine gnomish craftsmanship. Blade Width at Widest Point: 2 in. Sword Weight Without Scabbard: 0 lbs. Blade is supplied sharpened standard but,the edge may be removed upon request.